Now that you are a bit comfortable with your IDE and Java itself we will code the initial lines of the game in this tutorial. No login or password is required only specify the ‘Local Folder’ to match your needs. Open the project if NetBeans asks you. For some screenshots look here. Right click the project->and click Test. The unit test window should pop up and all tests should pass (green). Open the class InitialBlockGame which is located under the package called de.tdtut.section2. Look around a bit. You might have already noticed in the first part that there are special characters which looks grey in NetBeans: the comments which do not effect the program execution. Now it is important that you look into the test case shipped with the second project to get a better understanding of the various types and possible operations. To run the test right click into the file and click ‘Test File’ or press CTRL F6. 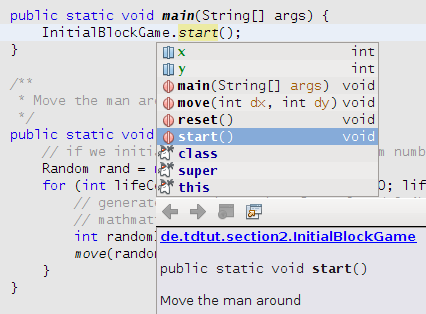 The first block is the definition of a class called InitialBlockGame and the second block is a method called start without a return type, so: void start(). There are also methods like move which requires method parameters. We cannot easily create a test case for this, because e.g. the usage of test within the move method wouldn’t compile at all! But in scripting language like Ruby or Groovy this could be done. Another important approach to manage the access of variables or even methods via the public, protected and private keywords will be explained in the next section. Then go through the code step by step via F8. Investigate the value of the variable lifeCounter through holding the mouse over it. This makes it very easy and fast to learn and explore unknown code (e.g. a library). This is the most powerful command an IDE provides you compared to a simple text editor. Try to invoke this command (CTRL SPACE) within the class definition block or after you typed ‘int’ within a method to see what the IDE provides you to make development easier. This means that if the change of move in x-direction called dx is too large it won’t be applied. The same is true for a negative dx. Look into the test case testMove() to get a better understanding and play around a bit with the code.